Shayanna Sivarajasingam - U12 Commonwealth Chess Champion! 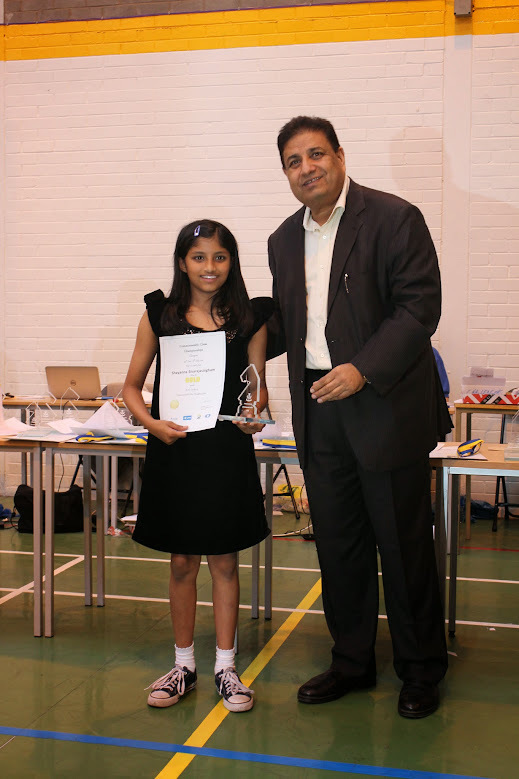 Shayanna Sivarajasingam has won the under 12 title at the Commonwealth Chess Championship 2014. In a mixed field, Shayanna finished a whole point ahead of WFM Tanishka Kotia from India, scoring eight points from a possible nine. Further success in the Sivarajasingam household came in the under 10 section. Venetia, scoring 6.5/9, won a silver trophy for second place in the U10 girls. Additional awards went to: Chirag Guha - Silver Trophy (2nd placed boy - U10) on 6/9; Ben Choo Yin - Bronze Medal (3rd placed boy - U12); and Nicholas Evans - Bronze Medal (3rd placed boy - U16).